December 13th: Professor Matthew Davidson "Sustainable Energy"
January 17th: Dr Philip Jones "Laser Tweezers & applications to Biology, Chemistry & Physics"
February 14th: Dr Oliver Rackham "Woodlands"
March 13th (Science Week): Jerry Stone "Colonies in Space"
April 17th: Dr Roger Wise "Welding Plastics, from rubber to wood"
Towards the end of October we received news that Comet Holmes had suffered a sudden, major outburst. The comet was initially discovered on November 6th 1892 by Edwin Holmes working in London. This was just 7 years before the formation of the HSS, and gives us a clue to the clearer skies enjoyed by urban observers at that time. Comet Holmes is one of the Jupiter family of comets with a perihelion of 2.2AU and it has experienced similar outbursts before. At the time of its discovery it had remained bright for some weeks but then faded and erupted again in mid-January 1893 raising its brilliance to naked-eye status. During following returns, the comet remained very faint and this year was expected to be at about 17th magnitude. But comets are unpredictable beasts, that is part of their charm, and Holmes had a surprise in store for us this year. 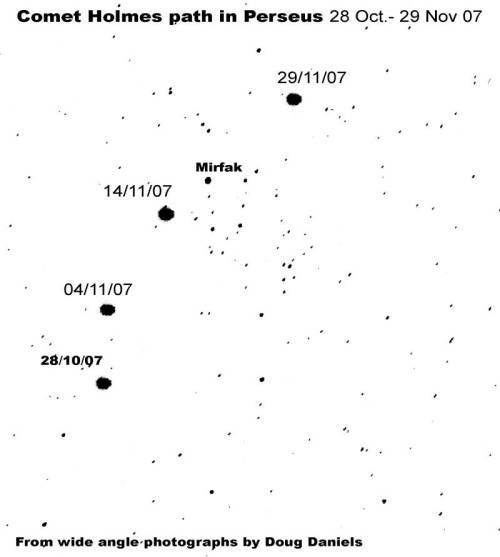 On the24th of October, the outburst was reported by amateur observers working in Spain. At the time Holmes was past its earlier perihelion in May, but close to opposition. Original estimates put its magnitude at +2.5, rendering it an easy naked eye object in Perseus. This is a 14 fold increase in magnitude equivalent to almost a million fold increase In brightness! During the outburst, Holmes appears to have thrown off a huge shell of material which appears to consist largely of dust, giving the comet an almost circular appearance with a bright central condensation and a tiny off-centre star-like nucleus. With an angular diameter of 15 arc/mins. and considering its distance, this equates to a physical diameter about the same as the sun! At the time of the outburst, the comet was situated in the constellation of Perseus, near alpha (Mirfak), close to the galactic equator and almost on the zenith at midnight. We were fortunate to have had several clear nights between Oct 28th and Dec.1st and this gave us the opportunity to observe and take images of the development of the outburst. During this period, the dust disk expanded to approx. twice its original size and its brightness gradually declined. The bright central condensation became more elongated and the following edge of the dust disk became fuzzy and indistinct. At the time of writing on Dec.1st Holmes was no longer visible to the naked-eye from London and the dust disk had expanded to well over ¾ degree. Holmes is a strange comet and the reason for such an outburst remains unclear. It has been suggested that a collision with some other small body may have caused it. This would seem very unlikely since the comet has undergone similar outbursts before, shortly after its discovery in 1892 and again in 1893. One collision might be a possibility, but three seems unlikely in the extreme. It seems more probable that the periodic outbursts are a result of fractures of the nucleus produced by the release of pent-up gravitational tidal stresses, causing a sudden violent eruption of volatiles from within. Whatever mechanism may be responsible, the result was very dramatic, increasing Holmes' brightness by a million times, over 14 magnitudes, and throwing out a dust/gas shell that rapidly expanded to more than twice the diameter of the sun. Holmes' brief 'blossoming' may now be coming to an end and it will revert to its former state, indistinguishable from the faint background stars of the Milky Way through which it is still slowly progressing. Holmes may well turn out to be the most photographed comet of recent years. With many amateurs and professionals alike using 'state of the art' imaging techniques and the comet occupying an ideal position close to the zenith in the northern hemisphere. Holmes has given many astronomers a wonderful opportunity to obtain a full pictorial record of the rapid development and decline of a unique comet. To see images showing the development of Comet Holmes, check out the Society's web-site: www.hampsteadscience.ac.uk/astro go to Galleries/Comets. Indeed the similarities are so great that astronomers consider that they were formed from the solar nebula at similar epoch and position and were constituted of the same materials. Today, however, they have remarkably different surface conditions. On Earth the most volatile compound is water, and forms oceans which are 300 times as massive as the atmosphere. On Venus there are no oceans as the surface temperature, 457°C, is too high for water to be liquid; it is only present in the atmosphere and in trace amounts. Carbon dioxide is present in both planets but is distributed differently. On Venus it is the major constituent of the massive atmosphere, which creates a pressure at the surface 92 times that on Earth; on Earth the carbon dioxide is mainly locked up in limestone deposited from the oceans. The big question is why the two planets have evolved to be so different today. More than 30 spacecraft have made the trip to Venus since the American Mariner 2 in 1962, to establish the basic parameters of the planet and answer this question. Now the European Space Agency has sent the Venus Express spacecraft to study the atmosphere in detail. It was launched from Baikonur in Kazakhstan on 9th November 2005 and became fully operational in June 2006. In Nature of 29th November 2007 there are 8 papers (pp 629 - 662) presenting the results of the first year's observations; there is also a commentary paper (p 617) by Andrew P Ingersoll to summarise the results. Ingersoll speculates that being closer to the Sun may be the reason for the different evolution of Venus. More of its original ocean of water would have been in its original atmosphere. But water vapour is a potent green-house gas, warming the planet further, and all the ocean could boil off. The water vapour could be split into hydrogen and oxygen by the ultraviolet of sunlight, the hydrogen escaping into space and the oxygen oxidizing the crust. Hydrogen is lost faster to space than its heavier isotope deuterium, so the fact that the ratio of deuterium to hydrogen on Venus is 150 times that on Earth suggests that this was indeed how the water was lost. The massive atmosphere of Venus is 96.5% carbon dioxide, also a potent green-house gas. It has a depth of 100 km, with a thick cloud layer between 40 and 60 km altitude composed primarily of sulphuric acid droplets. The leading paper  presents a summary of the atmospheric conditions on Venus, including the circulation in the lower and middle atmosphere and in both North and south polar vortices. The Planet has no internal magnetic field and the solar wind can interact directly with the upper atmosphere above 100 km. The escaping ions are mainly hydrogen and oxygen, consistent with the continuing loss of water. The paper concludes that the two planets were similar initially but evolved differently. Earth's oceans converted most of its atmospheric CO2 to carbonate rocks while Venus lost most of its water to space. Venus is also a very slow rotator; it spins once relative to the stars every 243 Earth days. Oddly, it spins backward to its orbital motion. Indeed, the atmosphere also spins backward. It is not known how it got into this odd situation. This slow spin may be the reason for its lack of a magnetic field. One of the papers  reports measurements by the Venus Express magnetometer in the ionosphere which reveal strong, circularly polarized electromagnetic waves with frequencies near 100 Hz. They appear as bursts of radiation lasting 0.25 to 0.5 s; they appear to be whistler-mode signals generated by lightning discharges. The existence of lightning on Venus has been a matter of controversy; this is now confirmed. The mechanism of generating it is not yet known. However, members will remember our October lecture by Dr Peter Grindrod on "Volcanism on Venus". Radar studies of the planet's surface show many volcanic features, but are they active or extinct? Perhaps active volcanoes are the source of Venus's vestigial water and its lightning discharges.